Multiple open source reports indicate that financial structures controlled by Mr. Merino, currently the Deputy Minister of Foreign Affairs, have acquired hundreds of millions of dollars in unexplained wealth while helping the FARC guerrillas in Colombia, corrupt elements of the Venezuelan government, and other criminal groups move funds to safe harbor. For many years, there have been calls for investigation of Merino by conservative Republicns in the US Congress. These allegations have usually focused on references to Merino on a laptop computer of Colombian FARC guerrillas seized in a raid in 2008. The files on that computer, according to Merino's accusers, link him to weapons transactions for the FARC guerrillas waging an insurgency in Colombia. The new allegations appear to be broader than this, although the Congressional letter is devoid of specifics. 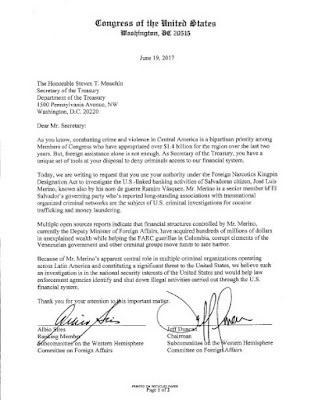 The FMLN in El Salvador was rapid and indignant in its response to the Congressional letter. 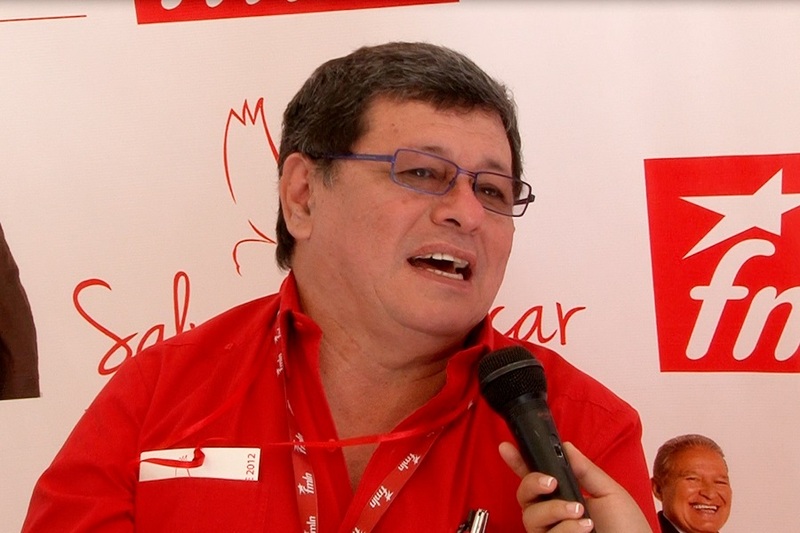 The FMLN said the accusations against Merino were defamatory, and not only were they false, they were ridiculous and offensive. The FMLN blamed the letter on ultra-right political elements from Florida who, the FMLN claims, want to destabilize progressive and left-wing movements in Latin America. Merino's direct and indirect involvement with various companies financed by Alba Petróleos and his long-standing relationship with the FARC are only the beginning. There is also Merino's alleged connection to Enrique Rais, a Salvadoran businessman whose airplanes were impounded in the United States on account of suspected drug trafficking in 2016. Rais is a fugitive from his own country evading corruption charges that implicate El Salvador's attorney general. Merino recently admitted in a televised interview that Rais is his personal friend, but he denied all other connections to the business tycoon. Two US federal sources confirmed last week to InSight Crime what was revealed in the congressional letter; namely, that in Washington, there are pending investigations opened by the Drug Enforcement Agency (DEA) and Federal Bureau of Investigation (FBI) into networks with possible links to Merino. With the letter signed by congressional officials from both parties, the suspicions surrounding Merino -- which the FMLN had previously perceived as political attacks stemming from the Republican Party alone -- have extended to both spheres of the political spectrum represented in the US Congress. An investigation in 2014 by El Faro revealed the web of businesses, related to ALBA Petroleum, fueled with Venezuelan oil, and where Merino plays a central role. It's not clear to me what jurisdiction US law enforcement agencies have to investigate Merino, unless they find that he was using US banks to launder money, or find that he is part of narco-trafficking involving drugs destined for the US. 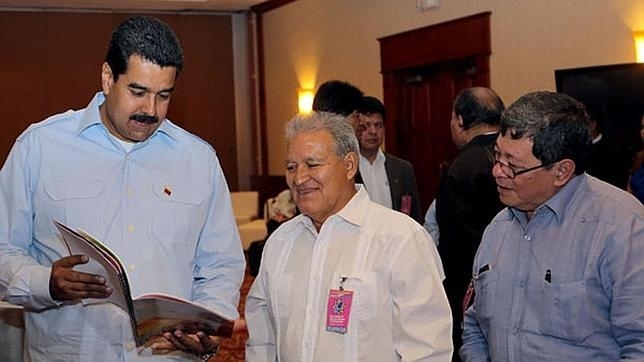 We may see US pressure for El Salvador to investigate Merino, but with an FMLN government, such an investigation is highly unlikely. The current attorney general of El Salvador Douglas Meléndez may again state that he has an open investigation, but that office has scores of "open investigations" that rarely seem to result in prosecutions. We can be sure, however, that the renewed uproar surrounding Merino will be used by ARENA as a major talking point in the upcoming 2018 national legislative elections and the 2019 presidential election.